Right in the heart of India’s beach capital – Goa, is a warm European beauty – The Fontainhas. A picturesque lane resembling a little Europe in Panjim, the capital city of Goa. Flanked by the Portuguese style houses and villas, the narrow lanes of Fontainhas reflect European flavor left behind. The name Fontainhas means ‘little fountain’ in English. It was named so when the little spring sprouted at the foot of the hill in the year 1770. Today, Fontainhas, sprouts with colorful villas, little motels and oh those graffitied walls around! Every other house feels like a piece of art – excuding happy vibes which sprout like a little fountain of happiness. Built in the late eighteenth century by a Goan expatriate, Antonio Joao de Sequeira used it for coconut plantation. 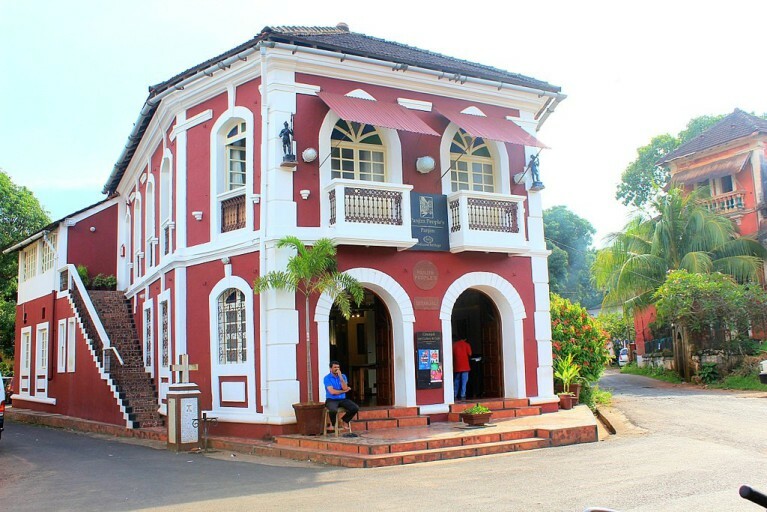 Post an epidemic in Old Goa, the Portuguese headquarters moved to Panjim. Fontainhas was then made the residential area for the then administrative officers and rulers. It was highly populated back then. The rich lived in large bungalows on the Panjim hill and less affluent on the foot of the hill. In 1984, Fontainhas was declared as a UNESCO heritage site. From crossing paths with this handsome blue-eyed, tall-enough-to-hug me cozy guy, to the bright colored houses, Fontainhas had me lost and found. The yellow, blue, green palate of Portuguese houses to quaint cafes, a trail walk in Fontainhas is your little poetry tour. Fontainhas is home to architecture spanning over hundreds of years – all of it unfazed by the modern architecture. While the lanes of Fontainhas took me back by an era, I came across this lady, chilling by the verandah of her home. Her age was just a few years less than that of her home. Walkthrough, house by house, lane by lane and get your own experience. As I walked through the lanes, I could peep into the desperation of how the modern culture awaits to break into. There are some designer stores that shine in those yellow lights. But just a simple house colored blue and surrounded by the lovely plants, defeat them. I believe, the roots are strong enough to make you fall for it, even when you don’t belong there. Take pictures of yourself at every place you can, but also visit some cute cafes around. Maybe sit down somewhere and feel the vibes around. This place is every art aficionado’s paradise. Gallery Gitanjali exhibits a collection of artwork dating back to the Scandinavian era. The art of local artisans and painters also sprawl in the gallery – and so do the artists and curators. In a rustic old building of Fontainhas, is Fontainhas most vibrant spot – Joseph’s Bar. The lane starts filling up with young Goans post 7 pm. Cheap alcohol, crafted beer and Cazulo’s special Urak keeps the conversation going at Joseph’s Bar. 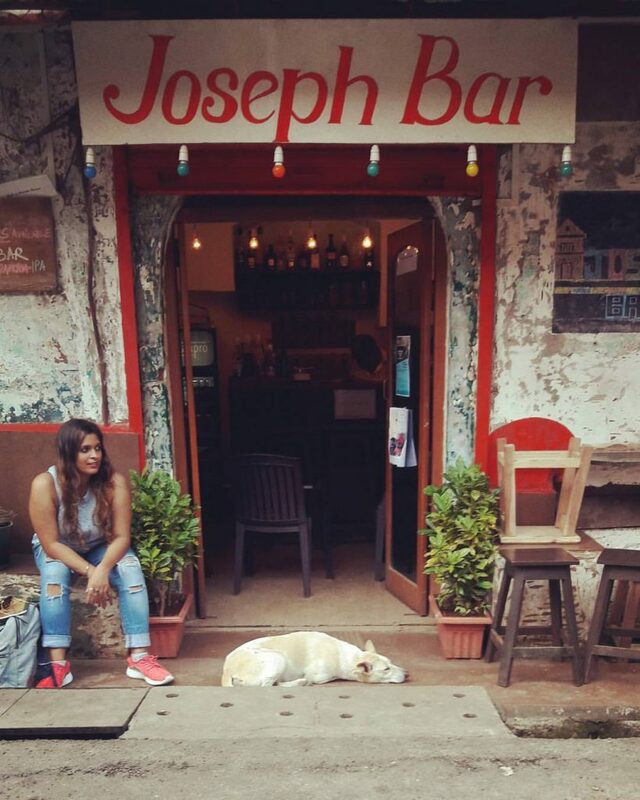 The very popular Gundu of Joseph’s Bar will greet you warmly and that short banter with him will make you feel home. From backpackers to office goers, everyone finds their little corner here. Goa needs to be explored more than to be just visited as a mere tourist. It sure is a land of beach, booze and more. But, look from different eyes, you shall see Goa offers a lot more than that. I am not a native of Goa but in the last two years, this place has become home. Goa has offered me more than what I could give it back. So far, I have seen different shades of the state but I, congratulate the people and the government for making sure that nothing could take away this little world away. A pilot, a businessman and an editor got together to make a film. And whattay beginning!